An overview of EPM's past Membership Meetings, Network & Nibbles, and AGMs. Dale Bruzell hosted EPM for an exciting event at the races. Members were treated to a facility tour or Assiniboia Downs event spaces, Winners Circle race experience, betting tips and great food. Heather Reid, Founder and CEO of Planner Protect Inc . walked us through contract education. Protecting our budgets should our venues close unexpectedly before an event. EPM’s 2018 Annual General Meeting was held at Trans Canada Brewing. Networking lunch at Promenade Cafe followed by a behind the scenes tour of Festival Du Voyageur. Jean- Luc Laflecher, Director of Operations, shared with us how this event successfully comes together each year and share some learnings that we can apply to our own events. The Forks, the famous tourist attraction in Winnipeg, hosted EPM's May Membership Meeting at the newly renovated space called The Commons. Freeman Audio Visual chatted with us about AV in unique spaces and all of the things we need to consider as Event Professionals when booking Audio Visual. EPM Members mingling at Robert Lowdon Gallery. Robert Lowdon Gallery hosted EPM for our Holiday Membership Meeting where EPM gifted each member a Professional Headshot photographed by Robert Lowdon. Robert Lowdon also spoke to us about Event Photography 101. Loungeworks showcase at RBC Convention Centre. EPM's Annual General Meeting was held at the RBC Convention Centre in 2016. Loungeworks went above and beyond and showcased their new furniture and decor. They totally transformed the space and it looked stunning! Guest speaker Dawn Bourbonnais with Volunteer Manitoba. The Winnipeg Art Gallery set a dazzling backdrop for our September membership meeting with Dawn Bourbonnais, Communication & Outreach Coordinator at Volunteer Manitoba. She spoke to EPM members about how to retain & recruit volunteers. Rob Wozny, Publicist and TV News Journalist spoke to EPM members about the secrets to making your event a media event. How to get the media out and coverage to help promote your event were a few topics touched on. The Victoria Inn graciously hosted us and put on a fabulous spread. Tania Douglas is a Certified Fundraising Executive (CFRE) who chatted with EPM members about how fundraising and events fit together. This informative discussion was held at the RBC Convention Centre where members snacked on delicious fare. Bringing our A Game at the Centro Caboto Centre. The Centro Caboto Centre hosted EPM's September membership meeting in conjunction with guest speaker Stephanie Staples. Stephanie pumped our members up with a discussion about "bringing our A game." The Victoria Inn hosted EPM for our January membership meeting where guest speaker, Allan Dubyts from Dubyts Communications, spoke to us about the key to communication and how to keep the communication flowing. Risk Management in Event Management with Rob Krisjansson. Rob Krisjansson, Special Events Liaison, Film and Special Events Guru, and Planner of Property & Development for the City of Winnipeg, met up with EPM members at the McPhillips Streets Casino to chat about Risk Management in conjunction with Event Management. Chief of Protocol for the Province of Manitoba. Assiniboine Park Conservancy invited EPM members to check out the new Qualico Family Centre. Guest speaker Dwight MacAulay, Chief of Protocol for the Province of Manitoba, highlighted what to do logistically when managing and transporting dignitaries before, during, and after your events. Unlocking the other half: Mind Mapping with Andres Boulanger. The Winnipeg Convention Centre hosted EPM members for our 2011 Annual General Meeting where Andres Boulanger, Magician, demonstrated "Unlocking the other half: Mind Mapping." Florist Supply Ltd. invited EPM out to their warehouse for a lesson on Event Florals. They covered everything from seasonal florals, to budgeting, to getting the best bang for your buck. Fun Fact: Florist Supply Ltd. actually has a small boardroom that can be rented as a meeting space. EPM members checking out the stylish Bridal Attire at The Met. The Metropolitan Event Centre invited EPM to check out the Anna Lang Bridal Fashion show where members got to have an up close look on how a fashion show is put together. EPM members received a delicious 4 course meal and appetizers and networked prior to the event. Delta Winnipeg Membership Meeting partnered with Tourism Winnipeg. The Delta Hotel, Winnipeg hosted the first Membership Meeting of 2016 in conjunction with Tourism Winnipeg. Our members learned about the different features Winnipeg has to offer in order to attract conferences and events to Manitoba. Contract negotiations - what are they? What does it all mean? Kelly Berehulka, Senior Manager of Entertainment at Manitoba Liquor & Lotteries taught EPM members all about contracts. How to navigate around the fine print in contracts and what does all of that jargon mean? He also touched on new ways to find entertainment. Club Regent Entertainment Centre hosted this informative membership meeting. Luke & Murray ,Two Man Band pumped up the party. The Hotel Fort Garry hosted EPM for our annual Network & Nibble. Luke & Murray, the Two Man Band entertained us while our taste buds were tickled by the culinary artistry of the Hotel Fort Garry. Christine Dubyts, from Dubyts Communications, describes how a little communication goes a long way to EPM members during our May membership meeting. The Delta Winnipeg invited us to host this engaging chat. Delivering large scale events at the Hitch n' Post Ranch. Hitch n" Post Ranch, a beautiful and unique location to hold wedding receptions held EPM's May membership meeting where guest speaker, Kevin Walters, discussed the steps on how to deliver large scale events. Aisha Alfa, professional MC, motivational speaker, and comedian. EPM visited Canad Inns Windsor Park where we were greeted by Aisha Alfa, professional MC, motivational speaker, and stand up comedian. She had us in stitches while commanding the room with ease and showing us the true value of hiring an excellent host for events. Speed Networking at Four Points by Sheraton Winnipeg. Four Points by Sheraton Winnipeg hosted EPM members for a special edition of "Speed Networking." It's just like speed dating, but with the concept of meeting other business professionals and making strategic connections. Fundraising, Logistics, and Planning with Lori Derksen. Lori Derksen, Fundraiser and Event planner for the Children's Hospital Foundation, spoke to EPM members about the logistics and planning for the annual Teddy Bears Picnic. Canad Inns Polo Park graciously hosted this dynamic chat. Steve Vogelsang with Getting the Attention you Really Want. Steve Vogelsang, Creative Communication Instructor at Red River College, partnered with Four Points by Sheraton Winnipeg to bring EPM members an engaging chat about "Getting the Attention you Really Want" in terms of social media and marketing. In October EPM made the trek out to the Niverville Heritage Centre to tour their dynamic space. Fun Fact: The Niverville Heritage Centre actually takes all proceeds from their event space and invests it back into the residents who live there. They also provided us with an amazing appetizer spread and we finished the evening with some networking. Craig Natress from Chamberlyn's Catering invited EPM members to the Historic Ralph Connor House, University Women's Club for our AGM. We enjoyed a delicious 3 course meal set in a unique event space while chatting about what's in store for 2017. The Alt Hotel treated EPM for our Membership Meeting in June. The Alt provided members with a generous and delicious lunch buffet which our members are still talking about! Shippam and Associates chatted with us about the Secrets of Swag: what works and what doesn't work. As well as introduced us to some cool new trends. Nadia Douglas dazzled EPM members with her smooth Jazz Vocals. The Manitoba Club invited EPM to host our annual Network & Nibble where members mingled, snacked on delicious eats, and listened to the smooth vocal stylings of local jazz singer Nadia Douglas. EPM Annual General Meeting at the Canadian Museum for Human Rights. The Canadian Museum for Human Rights hosted EPM for our Annual General Meeting in 2015. Guest speaker Liz Kay, Venue Volunteer Manager for FIFA Women's World Cup, highlighted key points on how to manage and organize the sheer volume of volunteers needed to execute the FIFA Women's World Cup in Winnipeg 2015. The Manitoba Sports Hall of Fame set a unique backdrop for EPM's October membership meeting. Deb Zoerb, Executive Director of Folklorama, discussed the aspects of delivering a multi-cultural, multi-venue event. With Folklorama being one of the largest festivals in Winnipeg, it was definitely an interesting and dynamic talk. Red River College invited EPM to hold our 2014 Annual General Meeting at The Paterson Global Foods Institute Campus. Guest speaker Patti Phillips spoke to us about the engaging topic of understanding. How great minds don't always think alike, and how to understand others' perspectives. Rockin' the mic with Danny Kramer Band. 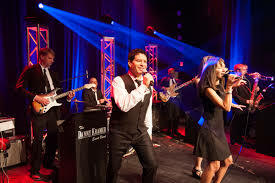 Danny Kramer let EPM sing-along with his band during our AGM in 2013 with a segment called "Let us Entertain You - Rock the Mic" at McPhillips Street Station. Definitely a fun way to engage our members during an AGM! Kal Barteski, local (famous) Manitoba Artist, joined EPM at the Holiday Inn Winnipeg Airport, Polo Park location to teach EPM members about having a bullet proof attitude which she has mastered throughout her career. Navigating Winnipeg with Rob Krisjansson. Rob Krisjansson,Special Events Liaison, Film and Special Events Guru, and Planner of Property & Development for the City of Winnipeg, joined EPM members to help us "navigate the city." Digital Scavenger Hunt at FortWhyte Alive. FortWhyte Alive invited EPM to a "Digital Scavenger Hunt." Where technology was used to communicate with EPM members as well as promote teamwork and problem solving. Murray Moman with Twenty Public Speaking Tips in Twenty Minutes. Red River College - Princess Campus hosted EPM members with guest speaker Murray Moman. Murray presented his speech about "Twenty Public Speaking Tips in Twenty Minutes."